On this page, you will find the network settings of your PC for use with a router solution (either hardware or software solution). This information is published on a seperate page, as it's being used for several other pages as well. The settings work for TCP/IP networks, either UTP or BNC (coax) based, using a router. This router can be a separate device, a (A)DSL/Cable modem or a server with for example WinRoute, all of them with DHCP activated. This page focusses on Windows 2000 and Windows XP. Related pages for different Operating Systems are: Windows 95, 98 en ME, Macintosh OS 7 of 8 and Macintosh OSX. Select "START" - "Settings" - "Control Panel" and click "Network and Dial-up Connections". Click "OK" and click "OK" once more. The client is now configured. Windows 2000/XP does not require a reboot, it takes a few seconds before Windows gets a new IP-address (Use IPCONFIG in a DOS-box to verify). TIP: Sometimes the connection appears to have a problem finding the router. 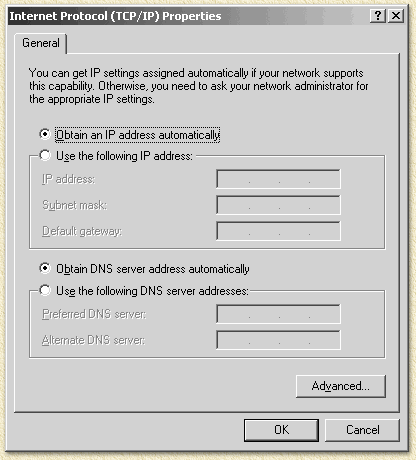 In the previous window, click "Advanced..." and add a DEFAULT GATEWAY. This should be the IP-address of your router! Users of Windows XP can do this also by requesting the "Status" of a connection. If you see an icon for the connection, next to the Windows clock. Click the icon with the left mouse button. In the apperaing window choose the "Support" tab. 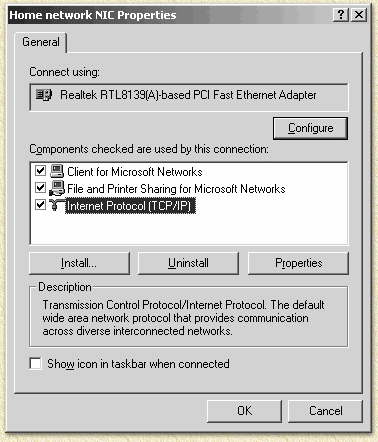 Using the Windows START menu -> Control Panel -> Network Connections. Here you will find your connection aswell, right click it and select the menu option "Status".